High performance upgrade intercooler. Provides improved cooling, and the ablility to run higher turbo boost if desired, without the possibility of the splitting the plastic end tanks on the original item - a common problem! Air conditioning may be retained with this intercooler, as there is approx 2mm clearance to the front panel. Front plastic panel may need to be trimmed and top holes enlarged during installation. 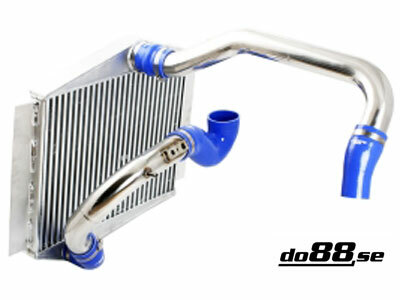 Intercooler Pipe Kit in stainless steel that replaces the OEM plastic & aluminium pipes! This kit reroutes the flow through the intercooler so the air that goes to the throttle body comes from the bottom of the intercooler. These pipes have a larger diameter compared to OEM pipes for improved airflow! Everything is included in this kit to replace both upper and lower intercooler pipes. This kit reroutes the flow through the intercooler so the air that goes to the throttle body comes from the bottom of the intercooler. Since hot air rises the hot air will be kept in the top of the intercooler. This will reduce the air temperature that goes into the engine. This pipe routing is shorter than the factory routing which will improve throttle response. The DO88 lower intercooler pipe has a very secure attachment of the pressure and temperature sensor in a custom casted / machined flange. Original attachment point of these sensors can often cause problems with leakage at higher boost pressure than the original.